Years ago I worked on a development team looking at the requirements of a good CRM System that could be developed to fit various business models, and one of the key requirements we determined was the ability to pull data from other sources around a business into the solution as a way of integrating business data (possibly as external entities) into the core business CRM Solution. Sounds simple in theory but can be pretty tricky in practise. With SharePoint 2010 I thought it was about time to take another look at this topic as the Business Data Catalogue has regenerated into the Business Connectivity Service and now comes alongside SharePoint Designer to allow for easier actual ‘no-code’ solutions to this age-old problem of integrating external sources of data into a single Line of Business Solution. 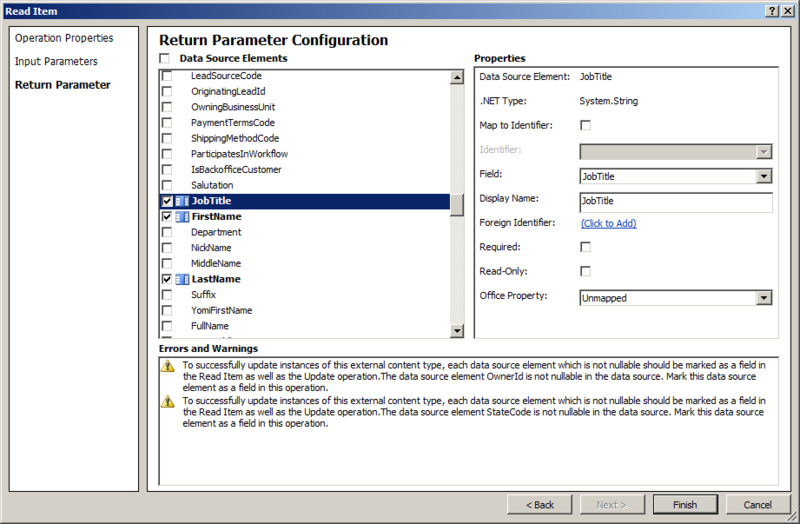 To look at how this can be implemented in SharePoint and coming from a Dynamics CRM angle, this post will be focused on how we can integrate CRM 2011 data into SharePoint 2010. 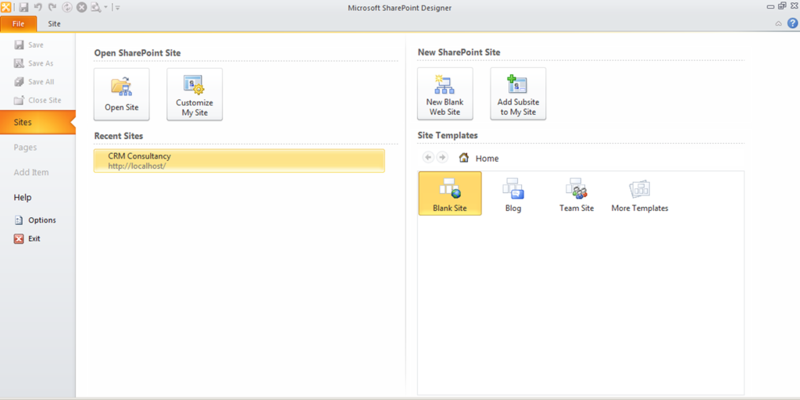 SharePoint Designer is a fantastic little desktop application which connects to a SharePoint site to increase the speed and ease in which standard customisations can be added to the site. Microsoft first tried this approach by adding functionality to FrontPage (TODO: Link) to connect to SharePoint 2003 sites with mixed results, and I often found it easier to simply perform the customisations using SharePoint’s native Web Interface – however in my experience SharePoint Designer is leaps and bounds ahead of these early efforts and makes adding and customising Custom Lists and other aspects of SharePoint sites considerably easier and quicker than the native Web Interface. This post will refer heavily to the SharePoint designer (alongside the Web Interface in places) for making the necessary changes to a SharePoint Site to facilitate the integration with CRM Data. 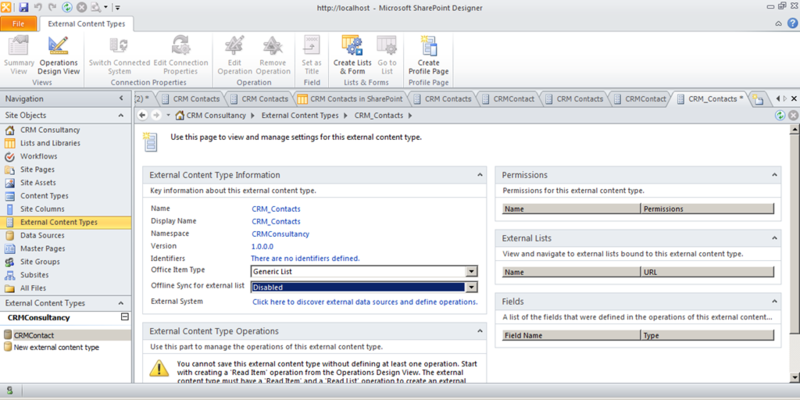 First of all we need to activate External Content Types within our deployment of SharePoint via the Central Administration area by ensuring that Business Data Connectivity Service is running. 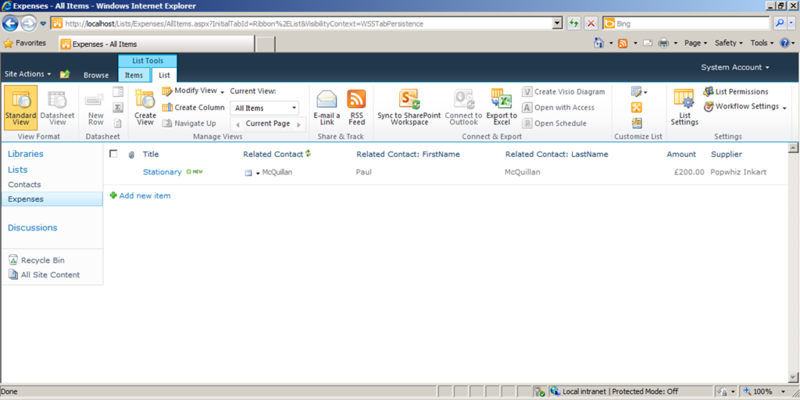 From here we can add a new External Content Type that acts as a wrapper to show CRM Data within SharePoint. (1) Add a new External Content Type with a unique name. 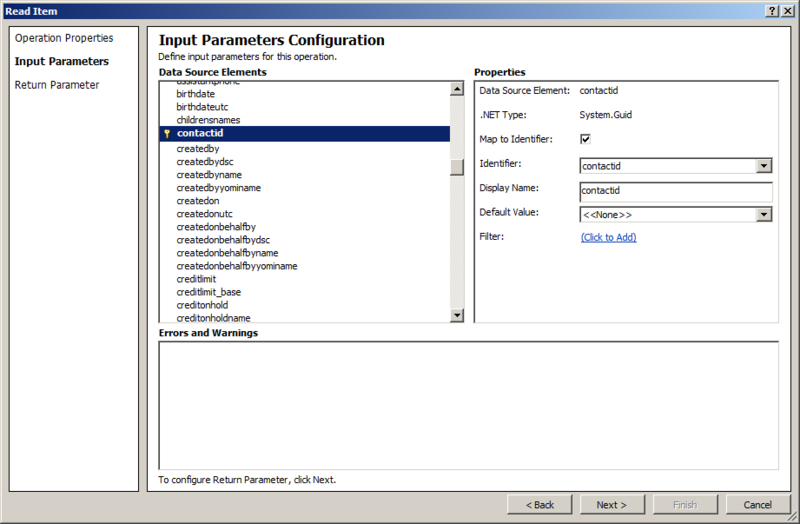 (2) Define the External System that the External Content Type is reading data back from – the SharePoint Designer allows a external system to be defined from either a .NET Type, SQL Server or WCF Service. 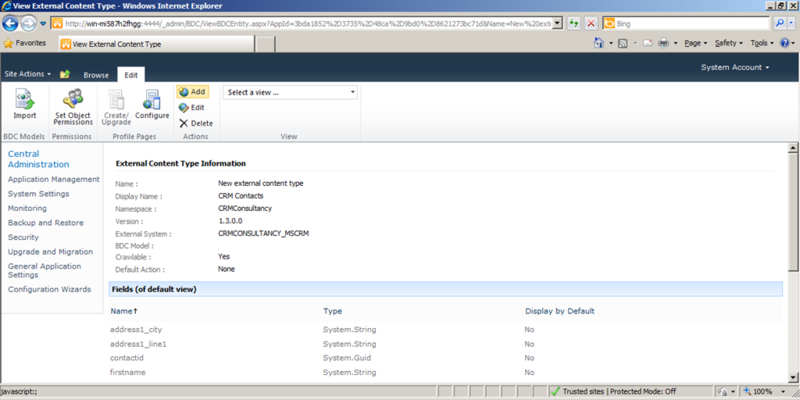 For a simple example of how we can connect SharePoint to CRM we can opt for a SQL Server Datasource that then uses the CRM View to facilitate a read-only connection from CRM to SharePoint using CRM’s Filtered Views. 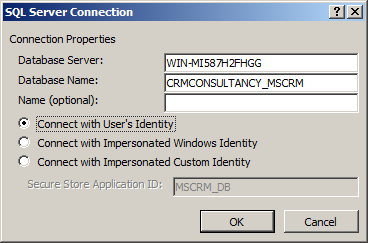 This provides a direct connection between CRM and SharePoint that maintains the CRM Security Model – however this does need to be Connected as the User’s identity such that the Windows Authentication for the account accessing the SharePoint List is used for accessing the Filtered View. 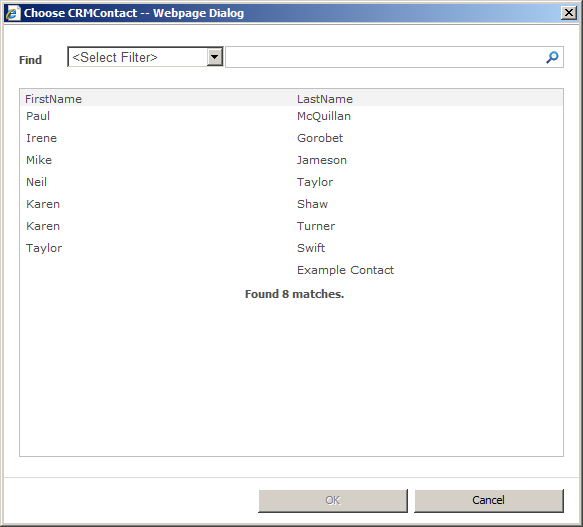 With the underlying connection in place, we can choose which table or view to use as the Data Source – in this case, the view for ‘FilteredContact’. Defining this operation within SharePoint allows us to define which fields should be read back from the CRM Datasource when viewing a record of this external type. With the same being done for the List Operation to ensure that the SharePoint External Content Type can be used for showing either individual records or lists of records within SharePoint. 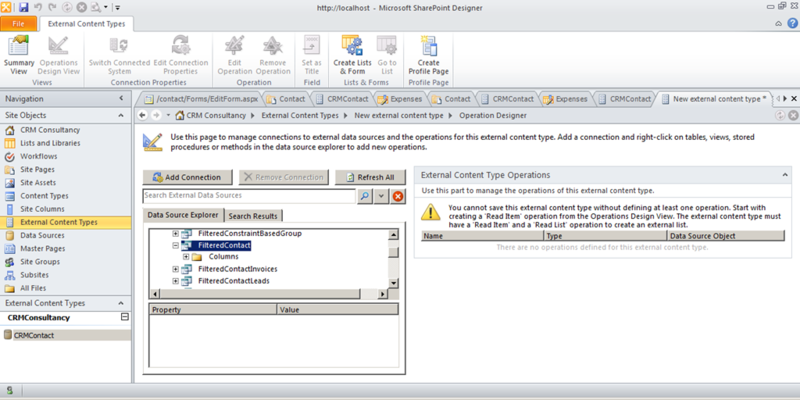 With the two basic read operations defined, our last step to configuring the External Content Type is to define which SharePoint users will have permissions to view data from the External Content Type, to do this we must access the External Content Type page from within the SharePoint Web Application as opposed to the SharePoint Designer. This is done by opening the SharePoint Central Administration area and then browsing Application Management, Manage Service Applications and then Business Connectivity Services. This then opens the Web Interface for adding or making changes to External Content Types in the same fashion as we have been doing through the SharePoint Designer. Selecting the External Content Type we wish to modify will then bring up a modification form for the External Content Type – which includes a ribbon button for ‘Set Object Permissions’. This brings up a prompt to select which Users or Groups should be able to access data through the External Content Type. 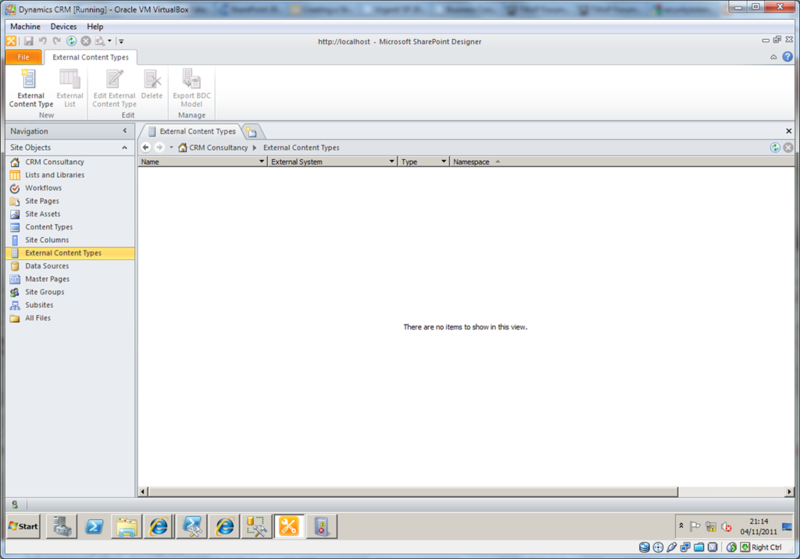 NOTE: If at this step you receive a ‘No Finders available in the View Group’ error, this is a generic SharePoint Designer error which can have many causes – in regards to using CRM Data as an external content type for SharePoint this is often related to using the calculated view fields such as ‘accountidname’ that SharePoint then struggles to incorporate into the Content Type. 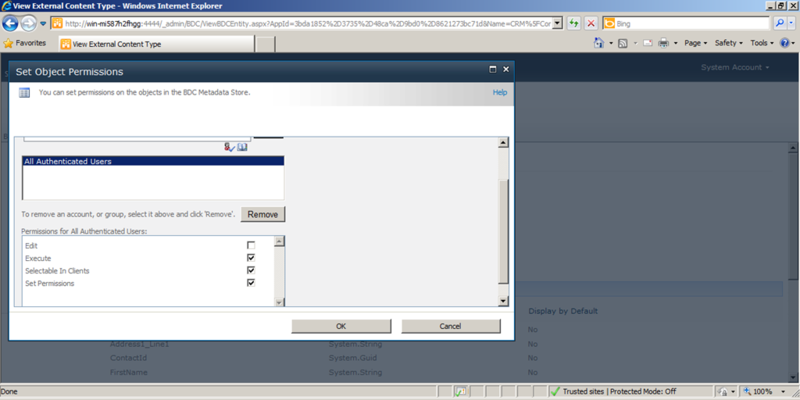 This List can then be modified as per any other SharePoint List to modify the View Columns or Sort Order. This external content list in SharePoint can then be used within other SharePoint-only lists as a lookup – providing a method for using reference data pulled from CRM to store data solely within SharePoint via a Lookup field type. 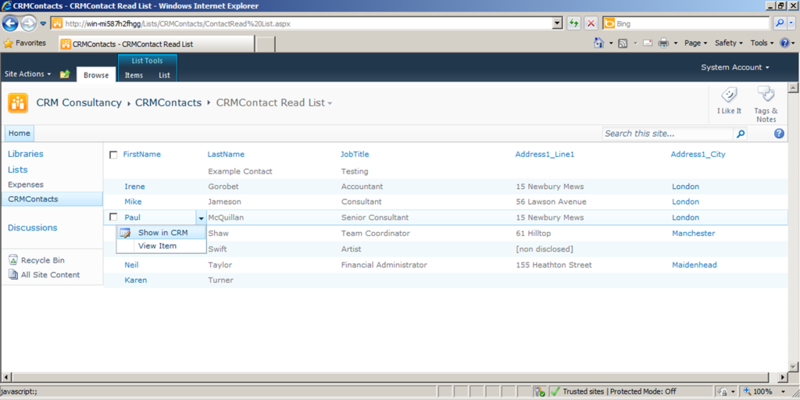 Allowing entries to be recorded in the list against a list of lookup records which is being synchronised from CRM. In effect allowing the selection of a particular CRM Contact for each Expense, in effect building an association between the SharePoint Expense record (in this case, an expense) and the CRM Contact record – bridging the two systems relatively seamlessly. 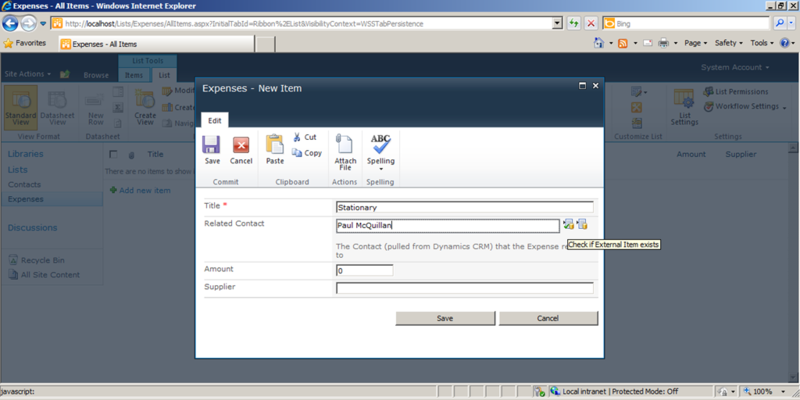 The resulting Item Record in the separate Expense List, linked back to the CRM Contact record through the external list. 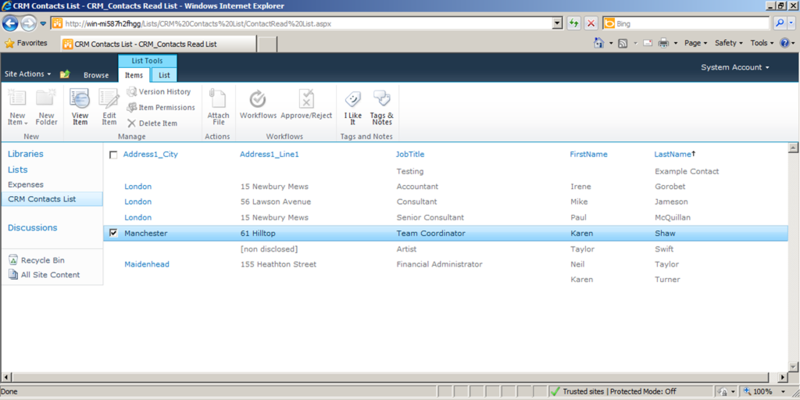 This then allows us to effectively synchronise data between CRM (or any other SQL, .Net or WCF system for that matter) into SharePoint, and then put this data to use in SharePoint via linked lists or reporting – further allowing SharePoint to be a ‘one-stop-shop’ of data from around an organisation. 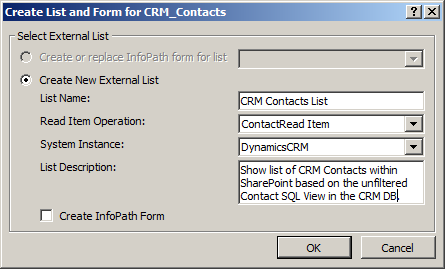 In addition to showing CRM Data within a SharePoint List we can add actions within SharePoint that can act to manipulate the data – in a simple case this can be simple as opening the CRM Form for the selected record from the SharePoint List. 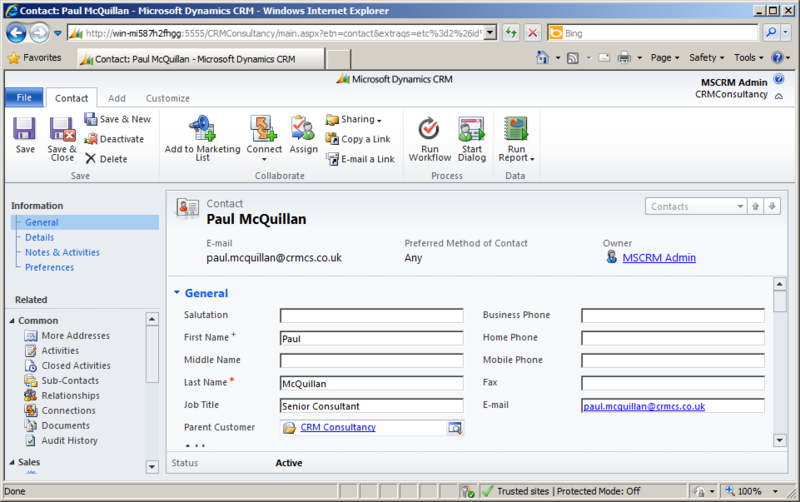 This will bring up a New Custom Action form where we can define what this particular action will do – in this simple case, providing the URL in CRM that the Action should open and any dynamic properties (such as the Record Id for the record in CRM that should be opened) that should be supplied to the URL. 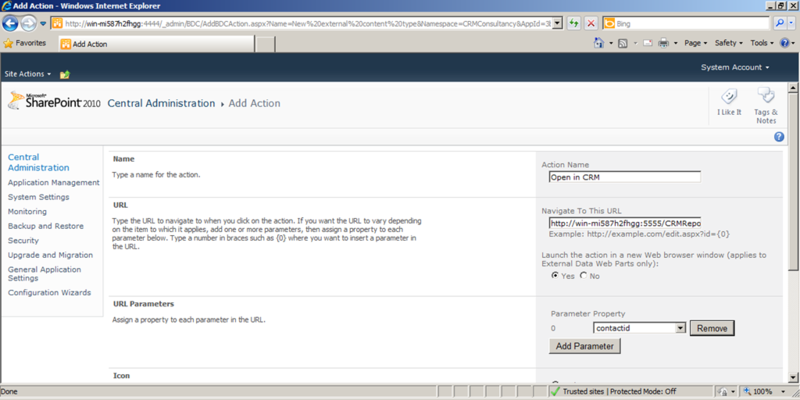 The Custom Action shown within the SharePoint List for each item. 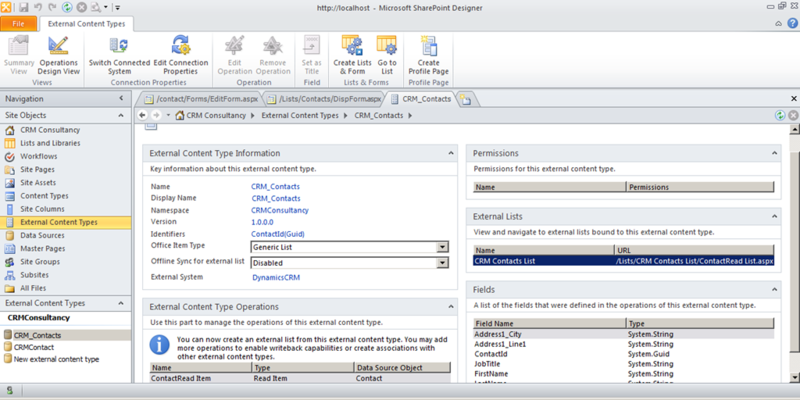 This post outlines how to use the Business Data Connectivity Services Application in SharePoint 2010 to incorporate data from Dynamics CRM into a SharePoint List – but why would we want to do this? The simple answer is to continue the SharePoint principle of encompassing a one-stop-shop of data throughout an organisation – in this fashion CRM Data can be constantly accessible from within a SharePoint site for publication and reporting outside the standard CRM User Group. When we consider how SharePoint List Data can then be used within other areas of SharePoint, particularly within Search, this gives a powerful outlet for sharing data and incorporating CRM Data into the central business intelligence of an organisation. This can be a powerful step to ensuring that SharePoint is the joining piece for integrating an organisation’s data into a single place across many possible disparate systems – and providing a single venue for Content Management and Reporting. In subsequent posts I may aim to expand on this further, in terms of how a Business Solution can incorporate SharePoint as the ‘hub’ for the business’s individual systems whether they be CRM, Accounting/ERP, HR or indeed any other operational systems. This entry was posted in CRM 2011, Integration, MSCRM, SharePoint and tagged businessdataconnectivity, CRM2011, Integration, MSDYNCRM, sharepoint2010, sp2010. Bookmark the permalink. 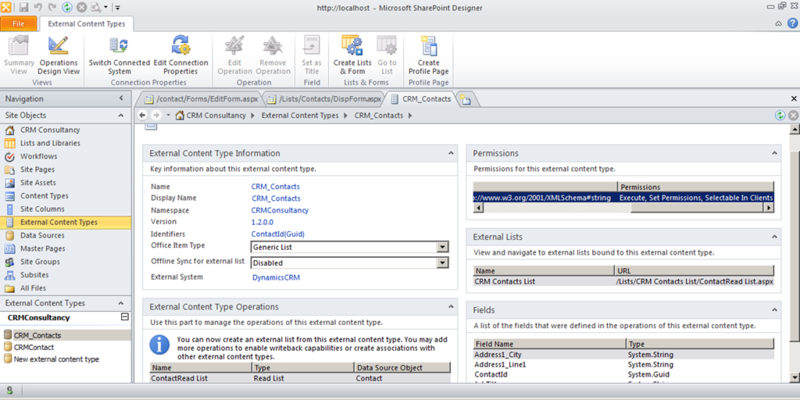 How would you integrate Dynamics with Sharepoint in a way that Dynamics fetch data from SharePoint list and show in Dynamics in a separate frame? Thanks for the article. I would imagine though that this would not work for CRM online instances since MS will not allow users access to the SQL servers they use, correct? 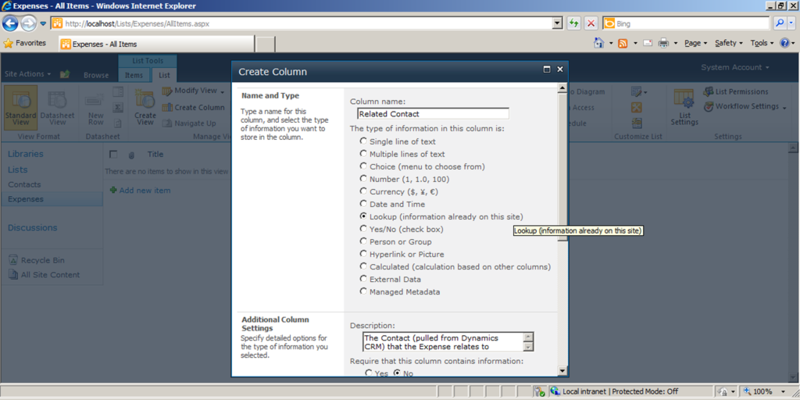 Aye, unfortunately correct – using CRM Online you do not have access to the SQL Views of your CRM Data, preventing SharePoint Designer from being able to base an External Content Type from the SQL Views. 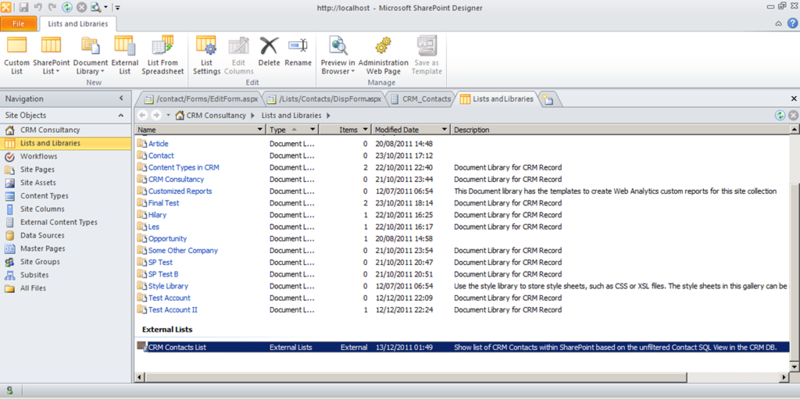 However there is workarounds in terms of basing an External Content Type from CRM’s WCF Service or developing your own Dataservice which reads back the data via CRM Webservices – this would give a method of creating an External Content Type that uses the WCF/Dataservice as it’s base for viewing the data in SharePoint. So it can be done, but is a more difficult development task.